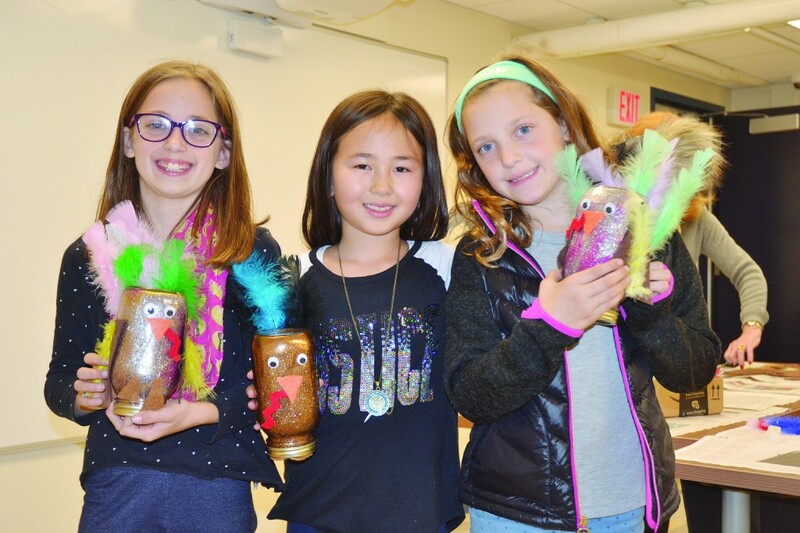 Library held a Kid’s Thanksgiving Craft event and for the first time in the library’s history, parents and kids created turkeys out of mason jars using feathers, glitter, glue and other materials. Children’s Librarian Jordan Bilodeau conjured up the idea while scrolling through Pinterest one evening and decided to incorporate it into the library’s monthly craft projects. This is the first time the library has ever used mason jars during any craft event, according to Bilodeau, and it turned out to be a popular idea. Within the first 24 hours of posting the event on the library’s webpage, all 12 seats were reserved. At the event, the kids were not only able to make new friends, but were also able to explore their creativity by making something unique. The project starts with an empty mason jar. The inside is covered with glue followed by the glitter, which is poured into the jar. It can be slightly dangerous because a glue gun needs to be used, so Bilodeau asked parents to assist. The kid’s get to have some fun shaking the jar around before the feathers are applied. Each child gets to personalize their turkey and let their creative side blossom. “My favorite part is the glitter!” said Valentina Cittadini, holding her turkey creation in her arms. The library’s new venture into mason jar crafts isn’t going to end at turkeys. According to Bilodeau, the library is considering incorporating mason jar crafts into its regular programming. “I think we will try other things. Someone suggested we could make snowmen out of mason jars, so I think we are going to try future mason jar crafts,” Bilodeau explained. For more information on the next craft event and other library programming, visit www.haddonfieldlibrary.org/events.